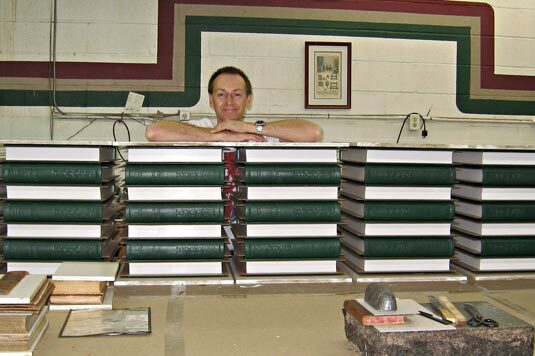 The three master binders at Felton Bookbinding of Ontario, Canada have hand-bound all copies of ANTARCTICA. These men, assisted by two sewers are presently hand-binding LABYRINTH SUBLIME. 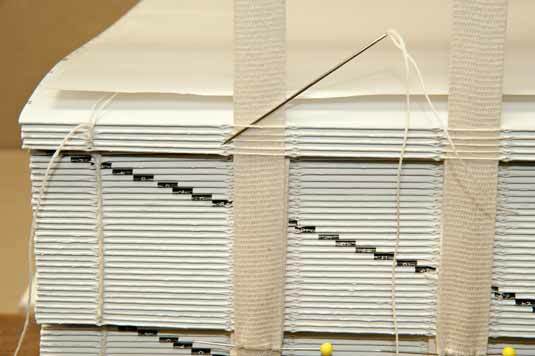 This is a process that can take several years, a reflection of the inordinate skillful labour required to bind books in the tradition of centuries past. The binding developed by Keith Felton when presented with the challenge of ANTARCTICA is actually a blend of two traditional bindings: The Classic European Leather Binding and The Split Board, Ledger Binding. Despite that binders around the globe considered the combination of these two styles to be technically incompatible, Keith obtained success following the making of several prototypes. The resulting hybrid binding is both elegant and strong. This special binding is specified for LABYRINTH SUBLIME. 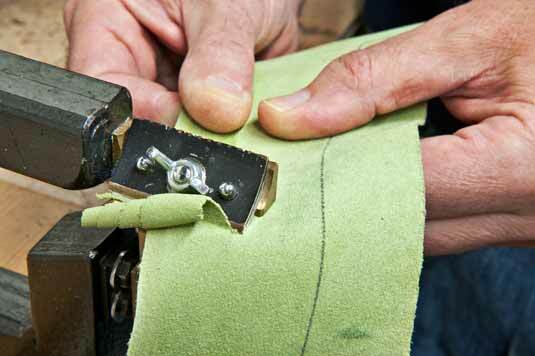 The Classic European Leather Binding is aptly named, for it is considered to be classical. This is the binding of the Italian High Renaissance, as exemplified by the famous Aldines — fine books printed and bound in Venice, 1494 through to the late 1500s by Aldine Press, the leading publisher of that era. Among the notable features of this style are: a rounded spine; raised bands on the spine; leather joints (leather reinforcement of the flyleaves near the spine and crossing onto the inside of the covers); and doublures (a specific treatment of the inside of the covers, where the leather turn-ins from the exterior are evenly trimmed to form a window in which is placed an inlay of silk, marbled paper, contrasting leather, or as in the Keough tomes, flocked velvet). Classic European bindings also have smooth, drawn-on covers with no French groove. The Split Board, Ledger Binding is also aptly named. Picture a scene from Charles Dickens A Christmas Carol with Ebenezer Scrooge's clerk Bob Cratchit on a high stool at his desk, quill in hand, working on accounting records. Such ledger books and registries, even library books in centuries past, all used the historic Split Board, Ledger Binding because it was strong, durable, and could withstand much use. 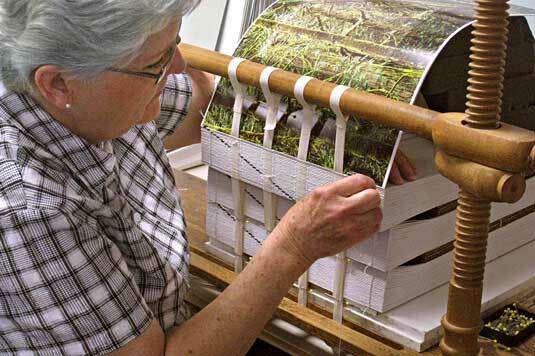 The secret is that the linen tapes woven to the spine of the book block during the sewing of the pages, were glued between splits in the cover boards. Short of purposeful damage, the pages could not separate from the cover. The practical French Groove had been invented in the late 1700s in answer to problems incurred in books bound with early split board methods — structural strength having created bulk which interfered with the ability to open the book. The French Groove is the vertical indentation that seen on almost all hardcover books today, running along the spine edge of the front and back covers, providing a thin flexible hinge. Perhaps because it was utilitarian, the French Groove was considered unfashionable among the binders of fine books in times past, and to a degree it still is. 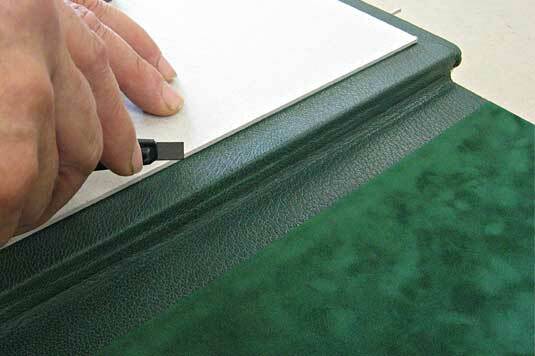 Certainly less skill was required to bind a book that opens easily when using a French Groove. LABYRINTH SUBLIME and ANTARCTICA share the stylish details of the Classic European Leather Binding, along with the rugged strength of the Split Board, Ledger Binding — and no French Groove. There have been no compromises. 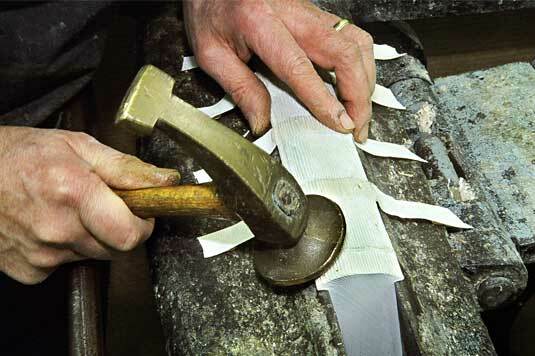 The skills and techniques used by the master binders at Felton date to the 15th century. In similar fashion to the Aldines, the complex binding of our tomes is accomplished entirely by hand; and this is why ANTARCTICA and now LABYRINTH SUBLIME take so long to bind. Full details about the sewing and binding of LABYRINTH SUBLIME with lots of photos with commentary are provided in Passion for Excellence.